A former miners' union rep who worked at Keresley Colliery is the face on The Enemy's new single, we can reveal. Mick O'Gara was the uncle of the Coventry band's front man Tom Clarke,and sadly died this year. He is pictured on the new singles front sleeve at a rally alongside National Union of Mineworkers' leader Arthur Scargill during the Miners' Strike of 1984-85. The photograph is on all posters and websites promoting the single released last week- "You're Not Alone" - a song about industrial decline and workers thrown on the scrapheap. Tom spoke with the Coventry Times about his uncle - who lived in Tamworth - when we caught up with the band last week, before they performed and signed records at Chalky's music store in Banbury. He said: "My uncle Mick was a transport manager and worked at Keresley pit. He did so much work for the union so we dedicated this song to him which is about the disappearance of industry. We don't know where the photograph was taken unfortunately, but it's clearly from the 1980s. Of course our families have been an influence on us. We grew up around them." You're Not Alone is an unambiguous political statement. It hits out at big business and government who "sold us down the river like rats" and was inspired by the band seeing other British post-industrial cities on tour reduced to a "wasteland". It is also well-documented as a gesture of solidarity with the thousands of workers who lost their jobs when Peugeot pulled the plug on its Ryton factory last year. Tom said: "Maybe Peugeot's closure couldn't have been stopped but if a strong union was there we would have heard about it more and it could have made a difference. We used to be so proud of our skilled workers and now they're working in call centres"
Since shooting to fame this summer, The Enemy have brought transparent youth protest and impassioned anger back into the popular music mainstream - so often ignored by other bands or disguised in a veil of ironic humour and pastiche. The Enemy's direct lyrics are about the emptiness and nihilism of life on the minimum wage in soulless jobs, with binge-drinking and brawling and only "crappy" escape. The band believes collectively people have power to change things. But they are canny enough to stop short of falling into the trap of some of their musical predecessors such as the young Paul Weller. He acknowledges he had difficulties in his Jam days when being heralded as the "spokesman for a generation", and later when he nailed his leftist colours to the mast with the highly-publicised Red Wedge tour. 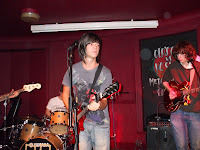 Tom, outspoken but also genial, shrewd and thoughtful, told us: "We're not a political band. 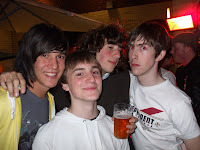 We're young lads, not politicians, and we wouldn't want to be. We give a social commentary. Our songs are about modern society and the problems are glaringly obvious." "For instance ASBOs are a ridiculous piece of legislation. They're not a deterrent and they're not a punishment. Many of the problems exist in schools. People aren't always educated in ways that encourage you to get yourself out there. You end up in an office in a factory or a shop. A careers adviser looks at you and sends you to a sh** job." With a gruelling summer schedule which included Japanese shows, a London gig with the Rolling Stones and the Coventry Godiva Festival - still the band's favourite gig - these three striplings could be forgiven for thinking life on the road has become just another job. They admit it's difficult to see family and friends and love coming home for occasional weekends. Another major tour kicks off today in Oxford (27/09) - and they expect a large Coventry following throughout. "Coventry people have been behind us from the start and even at gigs in other countries we always see Coventry flags", says Tom. But the boys are living their dream - first discussed when they were working in Fedex offices in Foleshill or selling TV's and when they met each other through mutual friends in pubs after work. 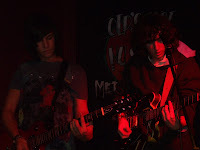 Bassist Andy Hopkins and drummer Liam Watts - who still lives with his family in Holbrooks - attended Heart of England and Cardinal Wiseman schools respectively. 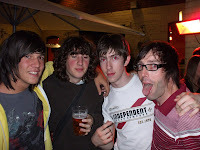 Tom, brought up in Birmingham before moving to Coventry in his early teens, again speaks on behalf of his quieter band mates: "This is not a job. It's still the dream. We're all just loving it. I hate it when bands start complaining." 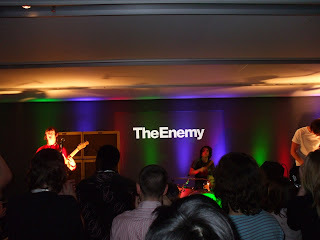 Coventry's very own - The Enemy, kicked off their tour last night in Oxford at the newly opened Carling Academy. 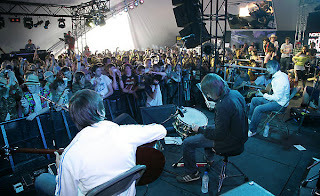 The gig was a sell out as crowds squeezed into the venue to watch The Enemy perform tracks from their number one album "We'll Live And Die In These Towns". The evening's line up started with The Wombats getting the crowd warmed up, such songs as "Kill The Director" and "Let's Dance To Joy Division" have attracted quite a following for the Liverpudlian band. Next up on the NME Rock 'n' Roll Tour was Lethal Bizzle, who got the crowd going with his song "Police On My Back" and everything was then set for The Enemy to come on stage and carry on the good work. The Enemy launched straight into their catchy "Away From Here" and the Oxford crowd were soon hooked as they sang along to other well known tunes "Had Enough" and the closing song "You're Not Alone" during the set. The Enemy Invite Lord Mayor For A Curry! 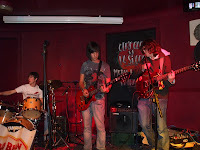 CITY indie rock band The Enemy have sent an invitation to the Lord Mayor of Coventry asking him out for a curry. The chart-topping group fired off an e-mail to Councillor Dave Batten suggesting he joins them for an Indian meal. The offer came amid calls for a civic reception to be held for the group. Cllr Batten wants to honour the Holbrooks-based band for putting Coventry on the map with number one album We'll Live and Die in These Towns, the first band from the city to achieve such a feat. Following a ceremony held by the city council for street dancing group Kombat Breakers, Cllr Batten agreed with fellow councillors that it would be a good idea to do something similar for The Enemy. Invitations were dispatched but, ironically, at the same time, band members Tom Clarke, Liam Watts and Andy Hopkins demonstrated their more informal tastes by e-mailing the Lord Mayor and suggesting he join them for a curry. A spokesman for Coventry City Council said: "We sent a formal invitation to The Enemy inviting them to a civic reception. "At the same time the Lord Mayor received an e-mail from The Enemy offering to take him for a curry! "We haven't heard back about the reception yet but it would be great if we could arrange both." The Lord Mayor said: "Hopefully I will get to meet them soon, although they are very busy, which is very good news." Cllr Tony Skipper, shadow cabinet member for culture, sport and libraries, believes a civic reception for The Enemy, currently at number 18 in the charts with the single You're Not Alone, would be a great idea. He said: "The lads' achievement certainly deserves civic recognition. "It will be a good opportunity to thank the families and backstage staff who have supported the lads in achieving success." Tom Clarke from The Enemy and Lethal Bizzle take about the upcoming "NME Rock 'n' Roll Tour", which kicks off this week and heads up and down the UK during October. Could we be seeing a collaboration between The Enemy and Lethal Bizzle live on stage? Check out the NME website for more updates. Coventry City have gone through to the final sixteen of the Carling Cup after a sensational 0-2 victory in front of a 74,000 crowd at Old Trafford. Michael Mifsud scored in the 27th and 70th minute, causing the 11,000 travelling Coventry City football fans to celebrate in style. After two league defeats, Coventry came out attacking and gave everything to Alex Ferguson's Manchester United. Although it was mostly the youth team, it still featured six international players, who seemed to have under estimated a determined Iain Dowie side. The supporters were 100% behind Coventry and in turn, the players and manager acknowledged this by delivering a result for Coventry that was reminiscent of the 1987 FA Cup final victory against Tottenham. The Enemy went along to Virgin Radio recently and recorded a live acoustic set as part of the "Zoo Session" for the station. They played "You're Not Alone", "Away From Here" and "We'll Live And Die In These Towns". Virgin Radio recorded the event, so not only do you get a fantastic acoustic collection but you get to watch Tom Clarke, Andy Hopkins and Liam Watts in action. With crystal clarity and moving lyrics the Virgin Zoo Session proves to be one of the greatest live sets The Enemy have done to date. It is available to download, so check out Virgin Radio for more details about buying the songs. 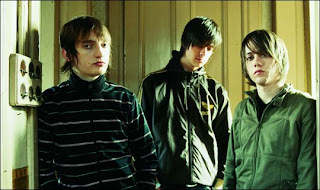 The Enemy have recorded "Father and Son" for the Radio 1 40th birthday celebrations. 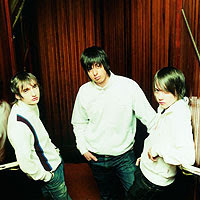 The song was covered by Ronan Keating and Yusuf Islam (Cat Stevens) in recent years but the Coventry trio go back to the roots for the Cat Steven's version rather than Boyzone. The song will be released on October 1st as part of the BBC collection album and can be heard on Radio 1 over the next few days. Just in case you have forgotten what the original sounds like, watch the video below. The Enemy have been as busy as ever recently as they promoted their single "You're Not Alone" and Iain Aitch from The Guardian newspaper interviewed Tom Clarke, Andy Hopkins and Liam Watts. they can't see simple solutions. time the Enemy came to Pentonville). suicide is at its highest in prison." manager. "That was dead weird," he says. a Paul Weller less pernickety about his clothes. last year. You can prove your worth on the tour circuit." 5,000-capacity Brixton Academy next month. seated prisoners, with prison officers strategically placed around the room. inmates sport a number-one crop. before the band was formed, it's hardly surprising they don't know the words. Enough, the inmates are on their feet. rewarding gigs we have done," says Clarke. talk about music, it's not surprising to hear the names that get referenced. realise I was listening to at the time." on. The reel-to-reel tape on there was Sgt Pepper's." Enemy's gigs, including some rather unlikely fans. policeman in the dressing room waiting to see you,'" says Clarke. Leicester gig last night, I was crowd surfing.'" The Enemy's single You're Not Alone is out now. 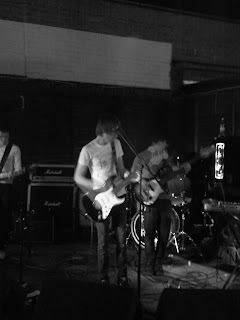 For more on Wasted Youth, see wastedyouthlive.co.uk . Interview from The Guardian. It's normally at this point I should be busy writing a review about the bands who performed at Kapow (Phoenix) in Coventry this week, but the truth is I got a bit bladdered! The Cougars were up from Cambridge, even though they had van problems, they still made the effort to come and entertain the Coventry crowd. The Promenade Stories and the Bootleg Poets did the business of warming the venue up ready for the final act, The Cougars. 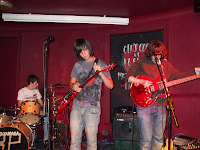 Check out The Cougars MySpace for more details of upcoming gigs. The Cougars and a tipsy robmacca. 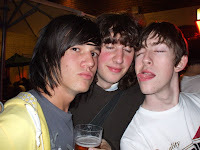 Ashley pouts, Ross dreams and Tom licks - perfect! 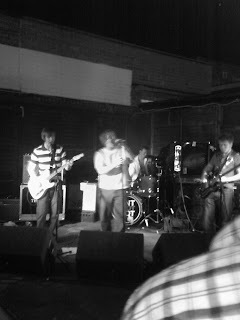 The Cougars in action @ Kapow, Coventry. More pictures and mobile video can be found: HERE. 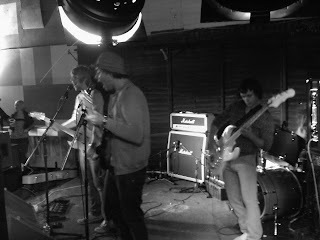 The crowd at Chalky's, "Banbury has never been so busy" commented a passer by. Tom Clarke, after signing a million singles this week. Liam Watts has really cute eyes! Andy is still happy at the end of yet another signing session. 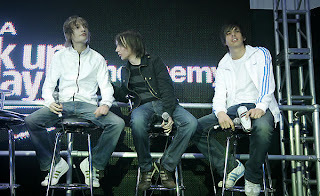 Liam and Andy must be thinking: "who's the stalker" "oh it must be that robmacca". The Enemy are tempted out with bottled water. Tom Clarke in a "ohhhh, suits you sir" face expression. Tom ponders...... "Right lets get this show started". "Hang on, let me get my jacket off", thinks Liam Watts. "Oi, get off my bum! ", protests Andy Hopkins as The Enemy depart the stage. The Enemy performed in front of an lively young crowd at Chalky's record shop in Banbury on 20th September 2007. This was the first time I'd seen The Enemy perform at an independent record shop and it was also their best yet. Having done Manchester on Monday and London today, it was time for a town like Banbury to have a chance to see The Enemy, devoid of tight security. Everyone at Chalky's, including management, did an excellent job of making the whole event a success and a pleasure to attend. Giving up my afternoon sleep and driving over to Banbury was worth it, I came away from the performance and record signing feeling very special. Tom Clarke, Liam Watts and Andy Hopkins treated Banbury's teenage crowd to a very intimate acoustic set (as the videos below clearly show. As Tom Clarke sang "You're Not Alone", you could see the real passion on his face. This is a song that is personal to him and that was reflected clearly. I felt goose pimples and a shiver down my spine because this song has come to mean so much to me as well. Having seen Peugeot rip the heart out of Coventry, I'm now seeing Royal Mail do the same and life as a postie has become tough. So it's comforting to know "You're Not Alone" and others are supporting you in your struggle for a decent way of life. 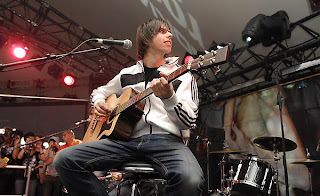 It was unusual not to see Liam Watts drumming with his usual vigor, all three lads were seated for this acoustic set and Liam was gently tapping away on his snare drum. But all of this helped in making the event even more personal, you could feel the pride in the lyrics to "We'll Live And Die In These Towns". I'm not sure the middle class people of Banbury would fully grasp the true meaning of The Enemy's songs from the heart but the crowds lapped it all up. Many getting body parts signed as well as the latest single out this week. You might think I'm a tad too old for record signings, but the whole experience keeps the connection between the fans and musicians a tighter fitting link which I feel part of. I didn't have the privilege of seeing bands perform until I was about 24 years old and it is only this year that Coventry's music scene has come alive in my life. Here are the full results from the Vodafone Awards held in London last night. Mika and Amy Winehouse were the real winners of the night, proving that the British music scene is alive and well and full of a diversity. Here is the full list of winners at the Music of Black Origin (Mobo) Awards 2007, which have been held in London this week. The winner of each award is in bold, followed by the other nominees in their category. The Enemy talk about how it all got started for them as a band and what playing in front of the Coventry crowd at the Colosseum means to them. 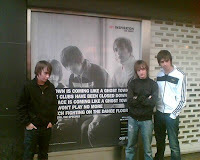 Tom Clarke, Andy Hopkins and Liam Watts share their thoughts on being in the biggest Coventry band and where they draw their inspirations. 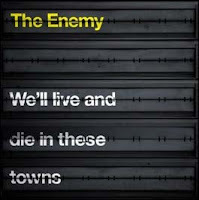 COVENTRY band The Enemy are set for another big hit with a new single inspired by the city's declining car industry. The single - You're Not Alone - is in the shops from Monday and industry experts are tipping the band to again hit the top 10, or even the top the charts. 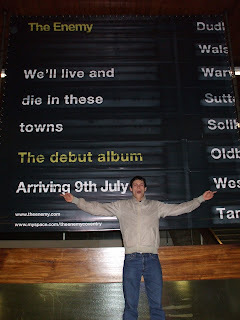 The track is taken from the number one album We'll Live and Die in These Towns. Speaking during a break in filming for Channel 4 show Transmission, singer Tom Clarke told the Telegraph how the end of car manufacturing in Coventry had played a part in the writing of the single. He said the song was inspired by touring the country and seeing first-hand how grassroots industry was dying in major cities. 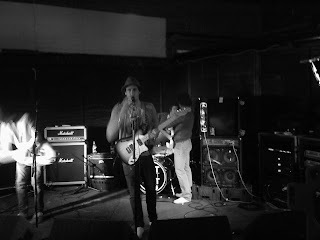 The firebrand singer instantly saw the parallels with Coventry's dying car industry and the song was born. He said: "When we went on our first ever tour with The Paddingtons we'd be going to all these places like Manchester, Sheffield and Leeds and saw all these similar situations to Coventry - the remnants of industry, what used to be people's jobs." Although the song could hit number one, Tom says there are more important things than chart placings. He said: "It's nice to know that people care enough to buy it but it's never about chart positions for me. 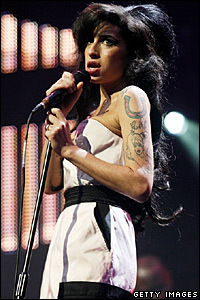 I get more out of e-mails from people saying how much the songs mean to them." It's been a sensational year so far for the band, scoring a number one album, playing all of the major festivals, including Glastonbury and V, and even supporting the legendary Rolling Stones at London's 02 Arena. 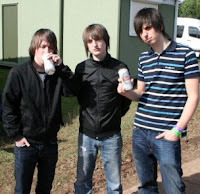 But Tom says the highlight was the band's homecoming performance at Coventry's Godiva Festival. 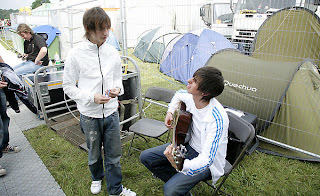 He said: "I think just walking out on to the stage at Godiva, to thousands of people, was the highlight. 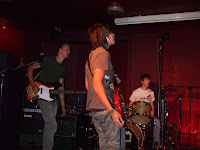 The hairs were standing up on the back of my neck for the whole gig." You're Not Alone is released on Monday. Interview from the Coventry Telegraph. 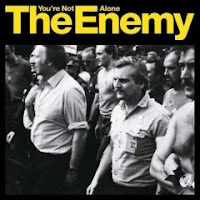 As Coventry's number one band -The Enemy are spending a tenth week inside the UK Top 40 album chart, the new single "You're Not Alone" is A-listed on Radio 1 and the band are about to do their bit to fight rascism on a free NME CD in a few weeks. Now it seems their fame is spreading far and wide, a review of "We'll Live And Die In These Towns" has appeared today in The Star Online (Malaysia), and what a good review it is. the stuff first visited by bands like The Clash. Alone, which follows, is another track in the same vein. Birthday Jane, a slow, melodic number that rounds off the album well. Pint Shot Riot read the riot act! 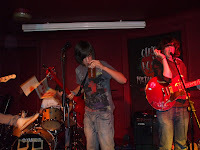 Pint Shot Riot took to the stage tonight at the Hope and Anchor pub in Coventry and the sell out gig went down a storm with the home crowd. Outside the gates looking in were a crowd of teenagers who never tired of joining in the riotous night, at one point a lad had climbed a nearby wall to appear over the roof! Pint Shot Riot were launching this as their single release gig and it certainly did not disappoint. The crowds were totally up for it, I've never been to such a happy riot in my life. The rioters had beaming faces as they danced and moshed and pushed each other around. All of this gave pleasure to the band who performed and gazed in approval. The mosh pit was a hive of energy, no one was being aggressive in a violent way, this was something pretty unique - this was lads and lasses using energy in a positive way. Sadly, the poor security team at the Hope and Anchor didn't know what to make of it all. They are used to Cov folk getting into fights and causing trouble, so came down to the stage and tried to curtail the rioters from being too energetic. It was amusing to view as security probably believed the crowd were getting out of control, yet this is what SHOULD happen at a Pint Shot Riot gig. At no point did I see anyone pushing another person out of malice, the only people with sad faces were the security team who had misunderstood how this all works! Pint Shot Riot gave the crowd a solid performance and were totally in their element playing for the Coventry crowd, making the night a total success for everyone in attendance. The Ldyls and Delta Rush were the bands lending support and in the crowds stood Andy Hopkins from The Enemy and John Dawkins from Grand Union Management. Hopefully this is the start of bigger things for Pint Shot Riot and the vibe from Coventry remains completely upbeat and exciting. The Enemy and The Ripps have already proved Coventry is an exciting place to be and Pint Shot Riot back this up with their own brand of music and lyrics that reflect life in modern England. Many have already been inspired by these bands and this is causing a wave of new bands to emerge and ride the crest of those who have gone before them. The Ldyls instantly get the crowd in the mood with their no messing attitude and swagger. Delta Rush provided lyrics and sounds worthy of a listen. Pint Shot Riot put on a free show at Hannigans clothes store in Coventry's Hale Street. 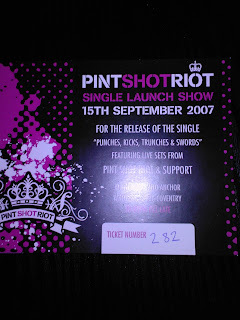 A crowd of about 70 people filled the store as others listened outside while Pint Shot Riot belted out their familiar tunes "Holes", "Treacle Town" and the new single "Punches, Kicks, Trenches and Swords" (released October 1st). 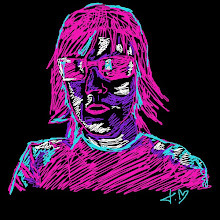 Check out the Pint Shot Riot MySpace where you can download a free tune "Riot Act", recorded live at the BBC. Kate Nash "Get Your Muff Out!" Kate Nash was asked told to "get your muff out" by a drunken heckler at an intimate gig earlier this week reports NME magazine. The drunken man shouted out during a quiet solo moment of "Little Red" and almost ruined the intimate set for the fans that were in attendance at London's Barfly. He may have had more than a sore head by the end of the event as Kate Nash responded with a "Boo" and surrounding fans began to heckle the drunk. Ryan Jarman (The Cribs) threw a pint glass in the direction of the heckler at the end of the gig, but luckily it missed the poor drunk who had probably wanted to see more than just a performance on a piano. 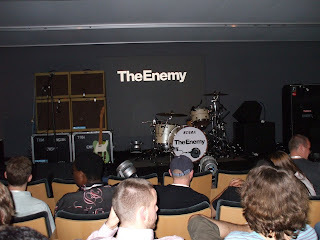 Earlier this summer The Enemy took part in a "Question and Answer" event for Nokia, here are a selection of pictures from the day, as seen on NME. Next week "You're Not Alone" is released in the UK and the Coventry lads will be busy promoting the single as well as preparing for the NME Rock n Roll Riot Tour. The Enemy prepare for questions. Tom Clarke and Andy Hopkins tune up. Here is the video and lyrics for The Enemy "You're Not Alone" featuring Tom Clarke, Andy Hopkins and Liam Watts from Coventry. The single is released in the UK on September 17th and is the third single from the #1 debut album "We'll Live And Die In These Towns". 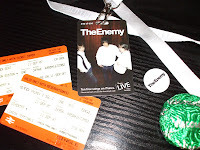 Train tickets, iTunes pass, The Enemy badge and a viscount buiscuit! Crowds remain seated until The Enemy come on stage just after 9pm. 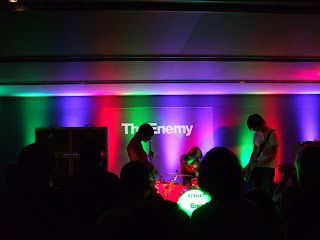 The Enemy performed an exclusive live session for iTunes last night in London and robmacca was there to see how it all went. Here are three exclusive live videos from the night on my brand new digital camera. The sound and picture quality is far superior to anything I have previously recorded on my mobile phone. There were a few Coventry people among the 140 guests at the Apple store in Regent Street, London and I felt honoured to be one of those guests after previously missing the AOL session because of a motorway pile up. Tom Clarke seemed to be on his best behaviour tonight, encouraging the crowd to stand and later to show some hands. This was a session after all and not a full blown gig - so crowd surfing would have been out of place. It didn't stop one guy semi-crowd surfing, admittedly he looked more like he was climbing over the seats but at least he tried. Another lad was standing on his seat loving every minute of The Enemy and waving his arms in the air in union with his hero's. Being pretty close up gave me an opportunity to watch Liam Watts do his stuff on drums, and my goodness he don't half give them a good bashing. You can see just how much effort he puts into the session on the videos. Liam's hair goes everywhere as he gives 100% into putting on a cracking performance for The Enemy fans among the iTunes crowd. 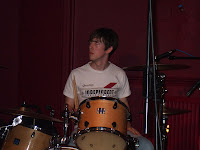 Andy Hopkins, as always, gave solid backing support to Tom - both on vocals and bass guitar. Making sure he didn't crowd surf must have been hard, but then this wasn't Coventry and I'm not sure some of the posher ones in the crowd would have caught him! It was a tight set with "Had Enough" as the opening track and "We'll Live And Die In These Towns" as the closing number and most of the album sandwiched in between. The iTunes session left you wanting more, much more of The Enemy. 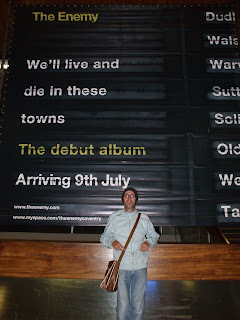 robmacca inside Cov train station with the giant Enemy album advert. Max gives it the big 'un back in Coventry!